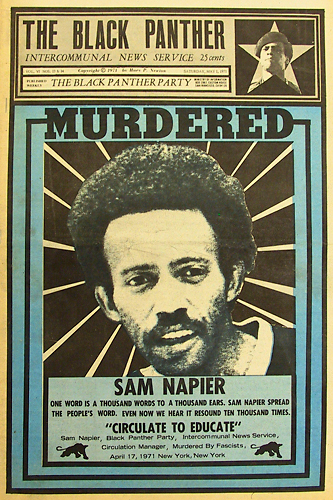 Twenty issues of the Black Panther Party newspaper from between 1968-1973. The Black Panther Party's politics and structure were Marxist-Leninist but it also represented one of the high points of class struggle in the late 1960s and early 1970s, so while we don't agree with all of the articles in this paper we reproduce it for reference. Many Panthers were killed or imprisoned but it is important to note that there are many ex-Panthers who continued to organise inside and outside of prison, write and develop their politics after the BPP collapsed, for example Lorenzo Kom'boa Ervin and Russell Maroon Shoatz). This is a really awesome archive!!! Thanks so much for posting these here. hey, that's cool that you were in the paper! Have you checked all of the issues uploaded above? Thank you for your kind words! I have searched ALL the archives on this website and could not find it. I have some additional information about the picture. it was on the FRONT COVER of the Black Panther newspaper. It was taken during the SUMMER for sure. But I don't know if the year was 1969 or 70 or 71 or possibly 72. Like I had said-the picture on the Front Page shows two little girls standing together, one black, one white (ME) and in the background it also shows my blonde haired 9 year old brother holding a free gallon of milk. Now I'm not sure if I am Also holding a gallon of milk And like I said- the picture was taken in the south side of Chicago in the Lathrop Housing Projects where I lived at the time. If anyone could find this FRONT COVER, I would be so very thankful. You can search the newspaper on the database Black Thought and Culture(there are all BPP newspaper). Some publoc library have this database, for exemple the Kansas public library.